In this article, we will tell you how you can add a custom text in the delivery estimates format when using the WooCommerce FedEx Shipping Plugin with Print Label. Start reading from below. 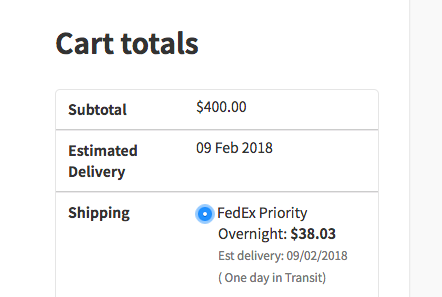 The FedEx Shipping plugin is an excellent plugin that allows store owners to show accurate delivery estimates. The delivery estimates that appear on the Cart/Checkout page are shown in real-time. So, depending on the address entered by the customer, the estimated dates would change accordingly. This feature is one of the most important and useful features of this plugin. However, at times some of our customers need to modify this feature according to their business case. This can be done by adding a code snippet into their WooCommerce. Following is one of our customer’s requests which prove to be quite common. We make use of this information in order to determine the amount of Dry Ice required inside the cooler as we pack the orders. We want this because having the date will make it more difficult for the staff members to calculate this. In this article, we will show you how to add a custom text by the end of the Estimated Delivery date. We will also show you how to customize the code in order to change it according to your need.